Seriously. 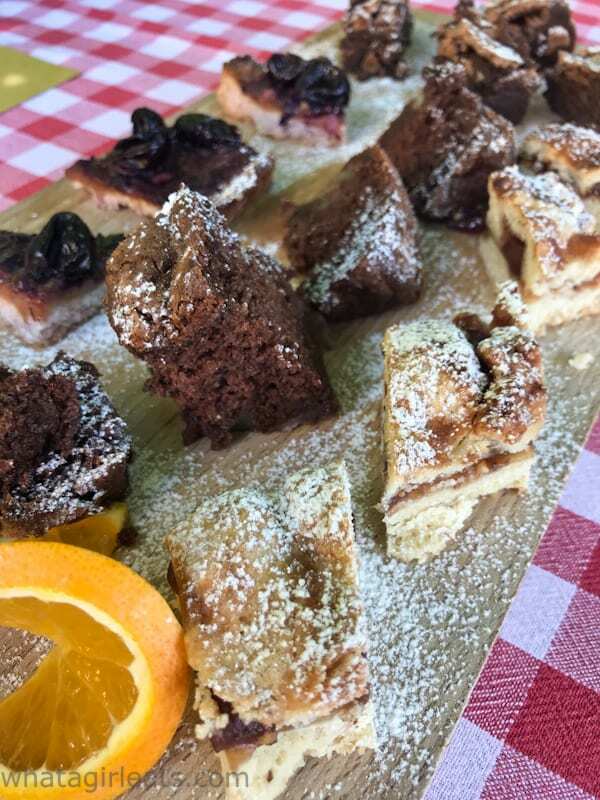 If you want a culinary “bucket list” experience that is a combination of intimate, educational, relaxing and quietly luxurious, the Cruise and Cook in Lugano, Switerland Tour is for you. Ok, “tour” isn’t quite the right word. 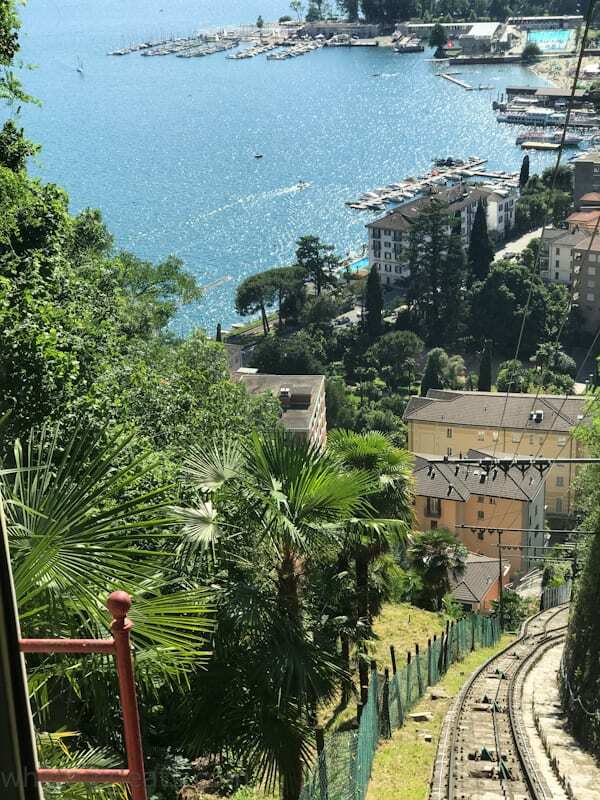 Funicular from railway station to lake. “How do people find out about this?” I asked. “How do people find you?” Patricia knows that she is not easy to find. “Well, there’s a link on the Lugano Region Tourism website” She wants to keep it a bit exclusive. To be perfectly frank, that’s smart. This is NOT your typical “tourist” experience. It’s all the better for that! Let me backtrack. 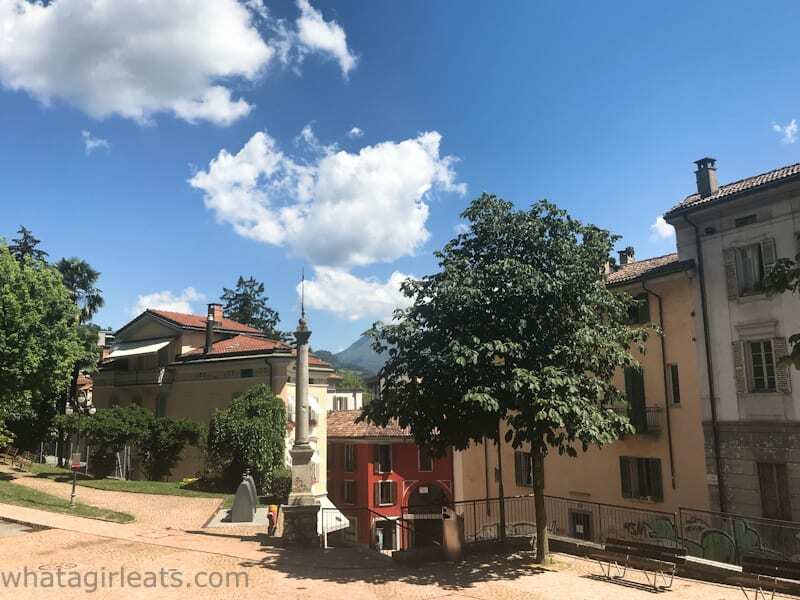 In my last post, Lugano and Bellinzona, What To Do In Two Days, Christina and I had to leave Bellinzona by 11 am to meet Patricia at the railway station by 11:30 (yep, Bellinzona is less than 1/2 hour from Lugano), so we could be at the dock by 12:15. Walking through Lugano to to lake. 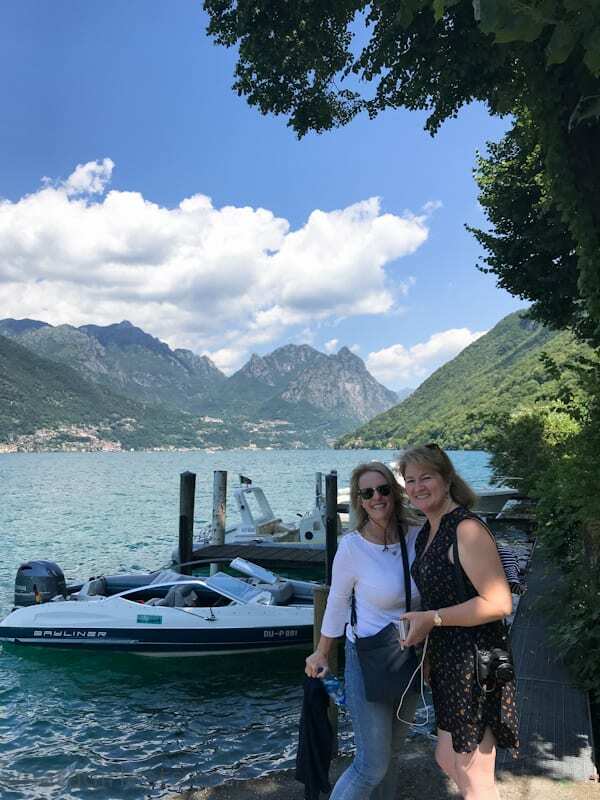 We took a leisurely walk from the train station down some stairs through the center of Lugano to the lakefront where Nicola was waiting for us with his boat. That was it, just the four of us. 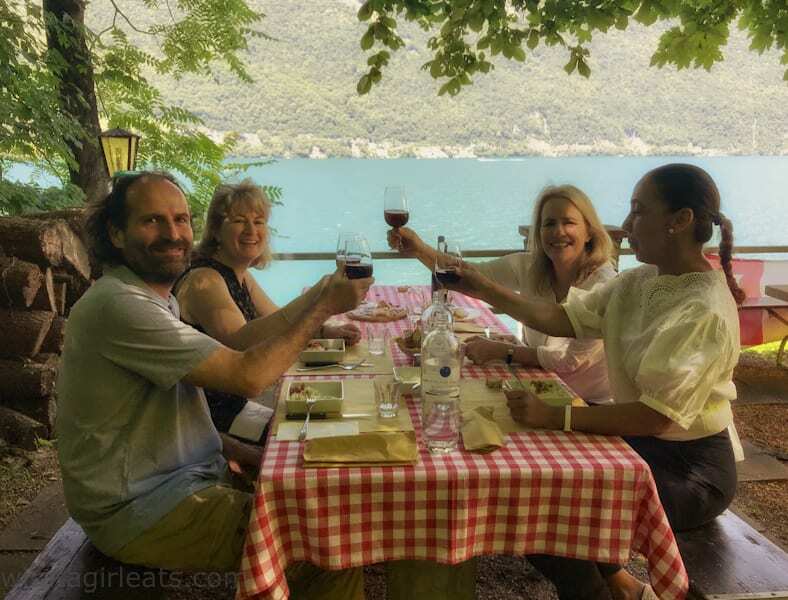 Nicola is the owner of Grotto Descanso, just a 20 minute ferry or water taxi ride across Lake Lugano to Gandria. (Nicola made a special trip for Christina and me. 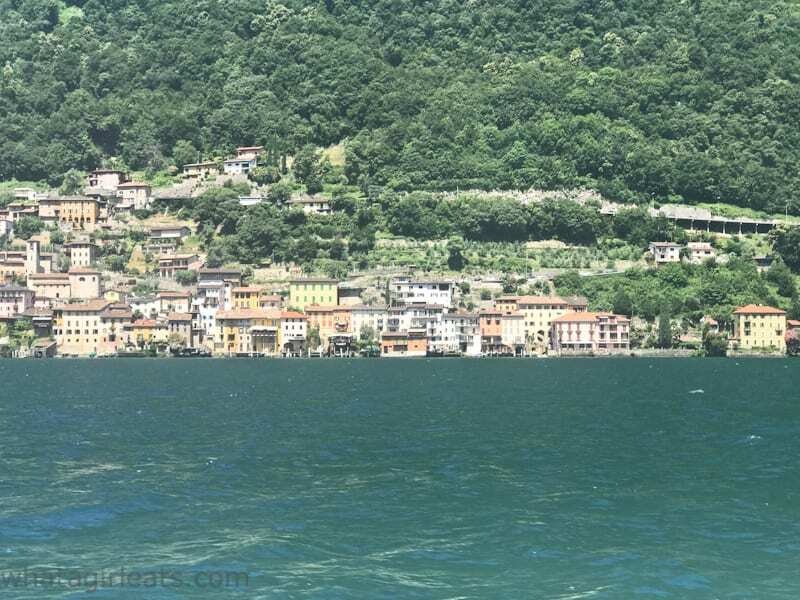 Water taxis are available in Lugano and frequently depart for locations around the lake). On the way to Gandria. We climbed aboard Nicola’s boat, feeling very much like European jet setters. 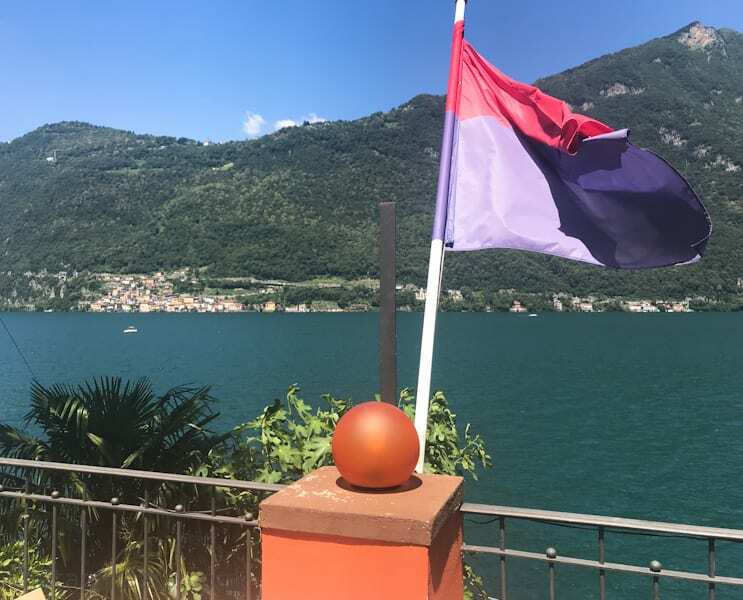 Patricia is charming and gave us tidbits of Lugano history, while allowing us to just enjoy the experience. 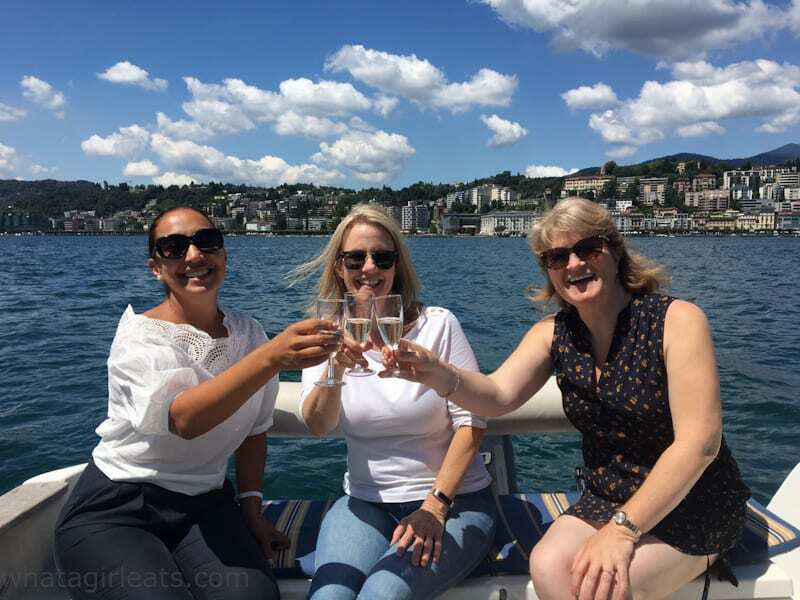 Patricia Carminati, Christina and me sipping prosecco on Lake Lugano. 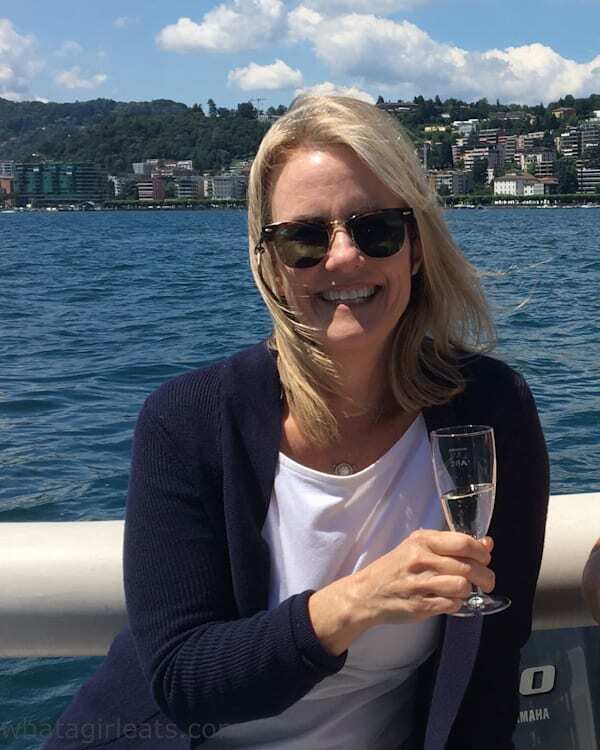 Half way across the lake, Nicola stopped the boat and pulled out Prosecco (what else?) and glasses and we toasted, chatted and laughed for a while. Then we continued to sip our prosecco, enjoying the breathtaking views surrounding Lake Lugano, while Nicola drove us to our destination. 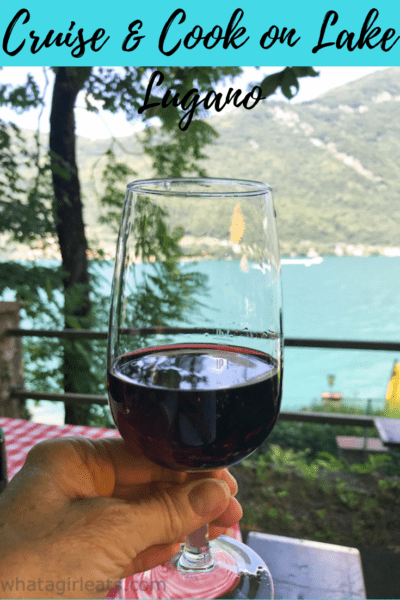 Enjoying prosecco on Lake Lugano. 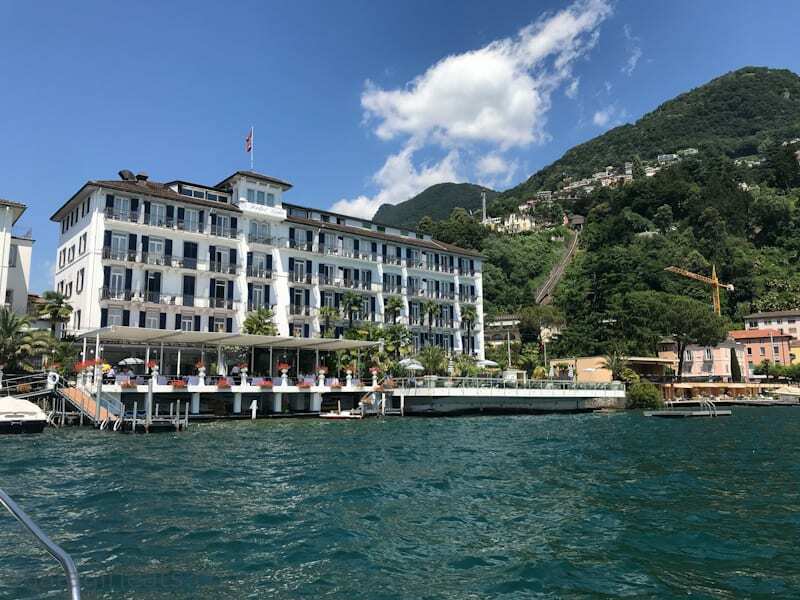 Grotto Descanso is right on Lake Lugano. Nicola pulled his boat into a slip and we walked up a few stairs to his restaurant. Boat slip at Grotto Descanso. 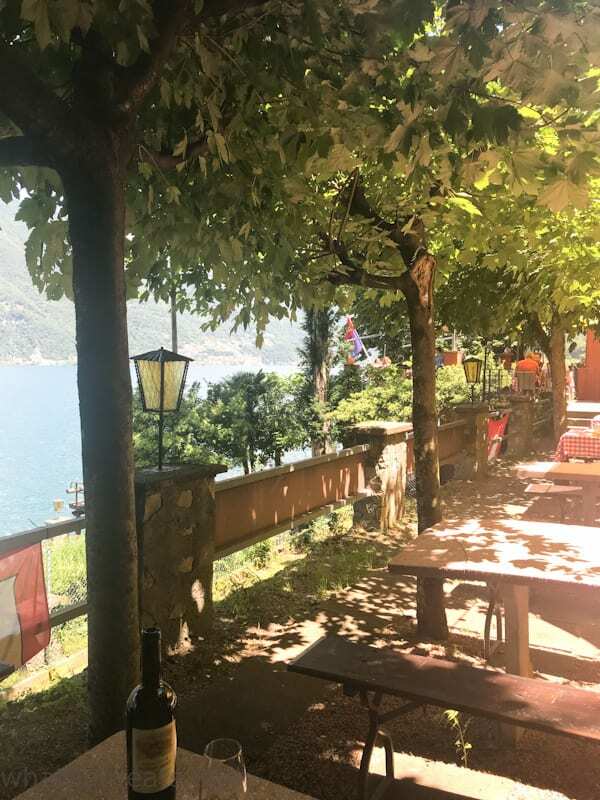 We popped into the kitchen which was humming, and then followed him to some tree shaded tables on the terrace, overlooking the lake. Peeking into the kitchen at Grotto Descanso. 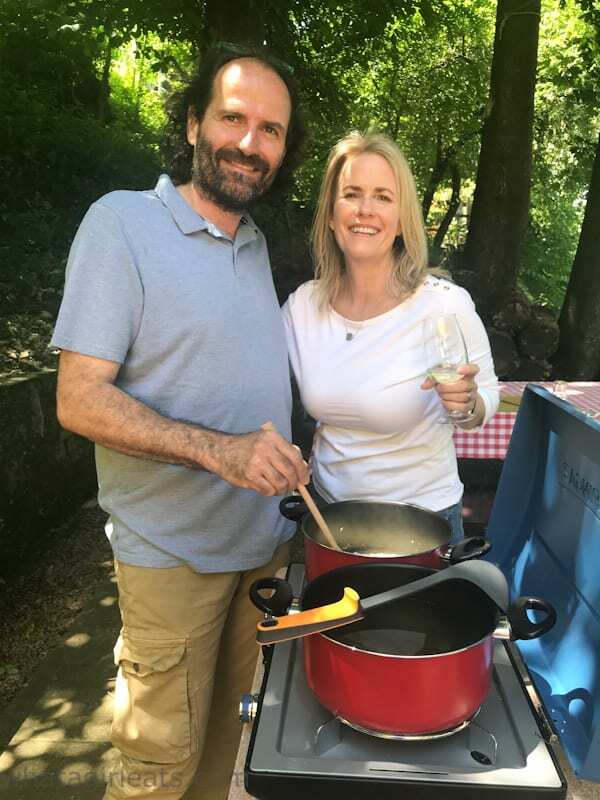 There was wine, and antipasto, as well as a little 2 burner camp stove and all the ingredients for our risotto making demonstration. 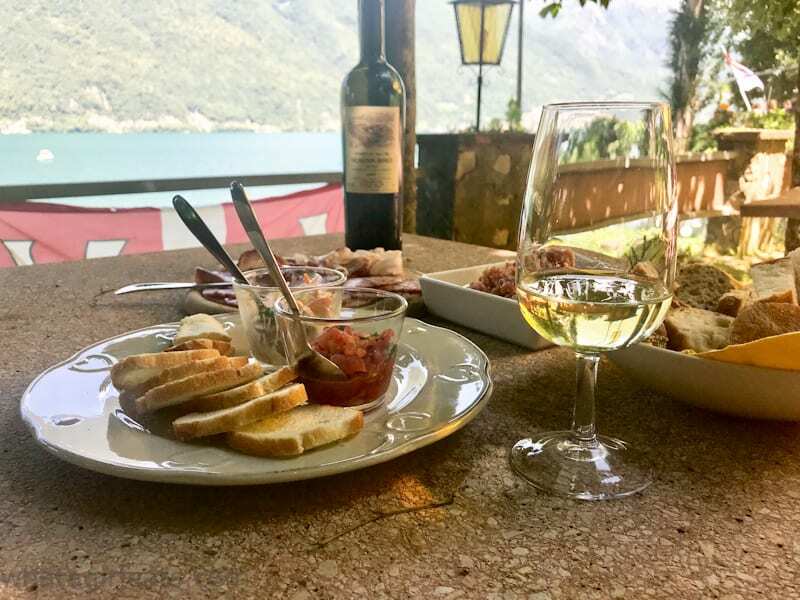 Nicola poured us some white wine while we nibbled on locally cured meats and cheese, and chatted about the fabulous location right on Lake Lugano. 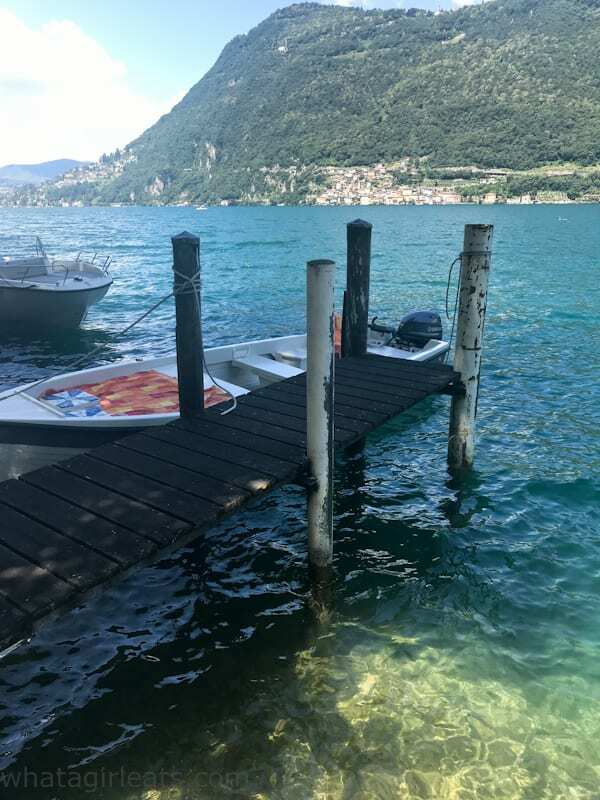 Even though Grotto Descanso is a 20 minute boat ride across the lake in Gandria, the restaurant was dotted with businessmen and locals, who take water taxis to lunch in the cooler grotto, and of course dine on Nicola’s delicious food. One thing about Europeans in general, is the respect they give to food and dining. 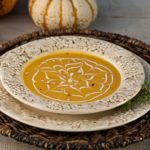 meals are not hurried, but rather savored. Nicola had everything set up and ready to go for our luncheon. 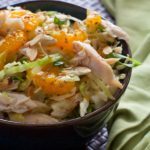 A server brought out all of the ingredients on a small tray in bowls just before it was time to begin. Both Christina and I were very impressed by the cleanliness of the prep area, as well as the attention to detail. Risotto is something that Christina makes all the time, but I’ve only made it a half dozen times. (Here’s her recipe for Risotto alla Milanese) So I was really excited to watch Nicola’s process. While Nicola cooked, Patricia translated or just described the cooking method. 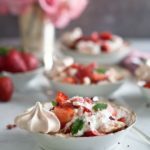 While risotto is definitely NOT a start it and leave it kind of meal, if you enjoy cooking and you’ve got friends over nibbling prosciutto and sipping prosecco, the 20-25 minutes goes by quickly. 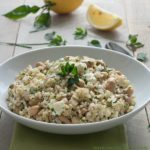 To see Nicola’s step-by-step Risotto making process, hop on over to my private What A Girl Eats Cooking Group for the videos! (Photo 1): Risotto ingredients, (Photo 2) sausage for the risotto, (Photo 3) two kinds of risotto, one with rosemary and one with sausage. While the risotto was cooking, Nicola cooked up some fresh local sausage in a separate pan, then chopped a handful of rosemary. 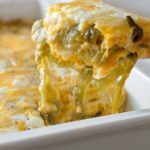 When he served it, he sprinkled one side with rosemary and topped one side with sausage. Although neither Christina nor I are vegetarians, I later thought how clever he was to present the dish this way, in case someone doesn’t eat pork or meat. The afternoon was just so relaxing. 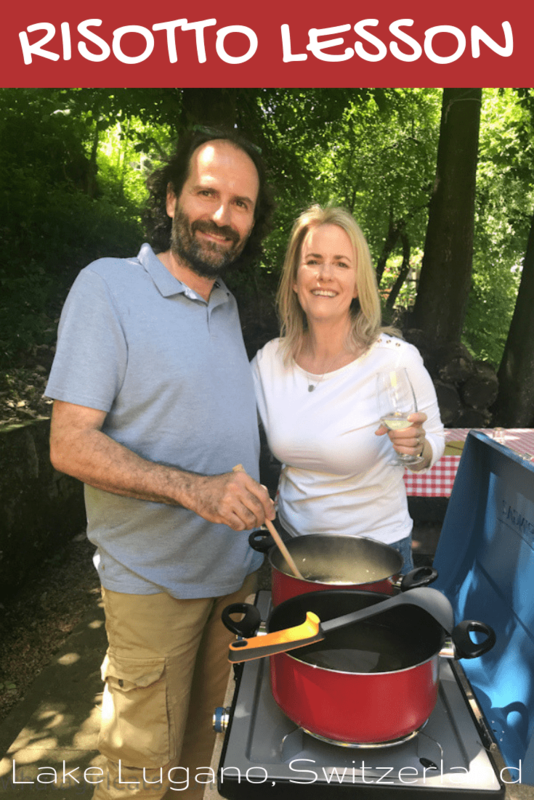 Dining on perfect risotto, with delightful company, at the Grotto Descanso. One of those day I’m sure I will remember forever. I wanted to capture everything about it, the company, the risotto and the location and sear it in my memory! Another surprising thing about European dining, is that the portions are so much smaller than in the States. 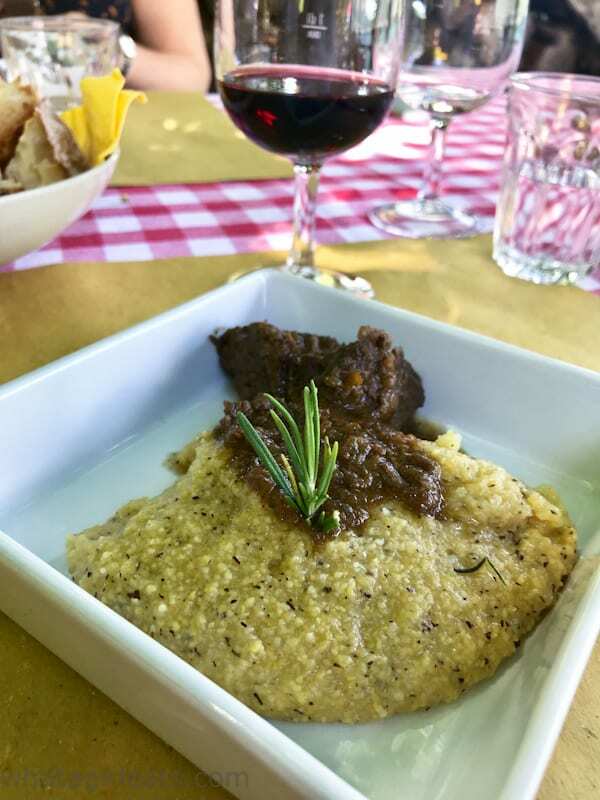 Polenta and beef stew…our THIRD course. 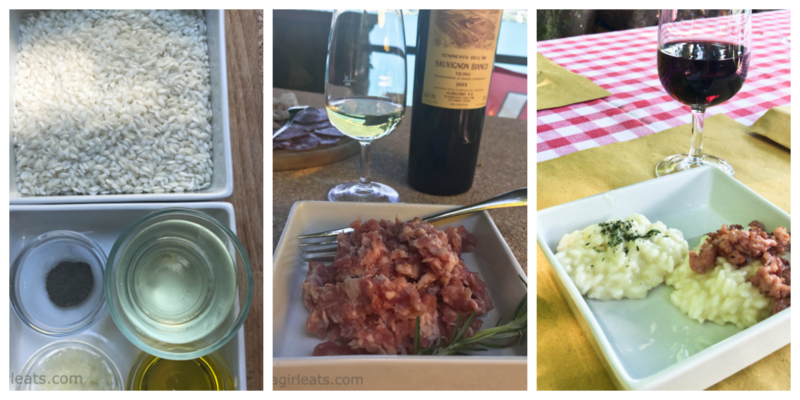 But once you’ve had antipasto, wine and bruschetta, the risotto was just perfect! 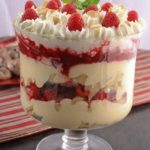 We thought we were done with that, but then Nicola brought out a lovely stew on top of polenta, followed by more wine and then a selection of Swiss-Italian desserts. 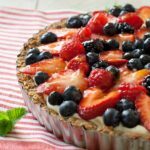 Selection of Swiss cakes and tarts. We hated to leave, but alas, we had more to see! 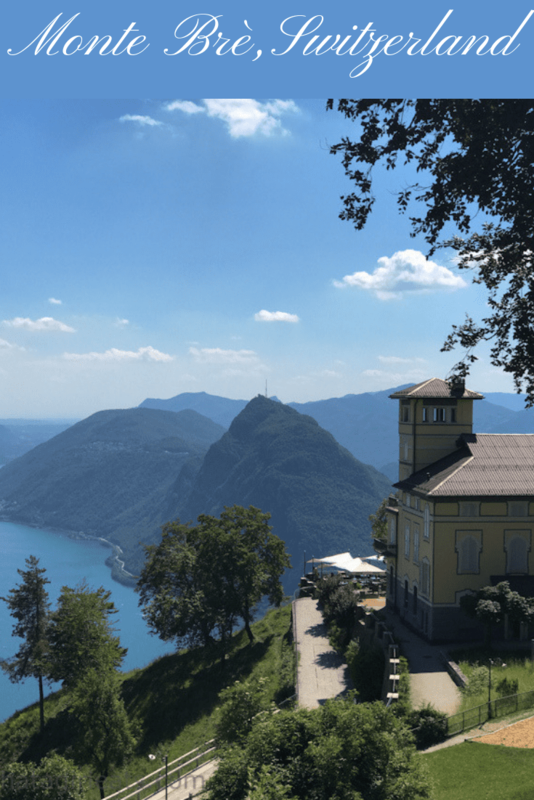 Instead of taking us back to central Lugano, Nicola and Patricia ferried us to the far end of Lugano, closest to the funicular that would take us to the top of Monte Brè. Nicola and Patricia dropped us off close by here to catch the funicular to Monte Brè. 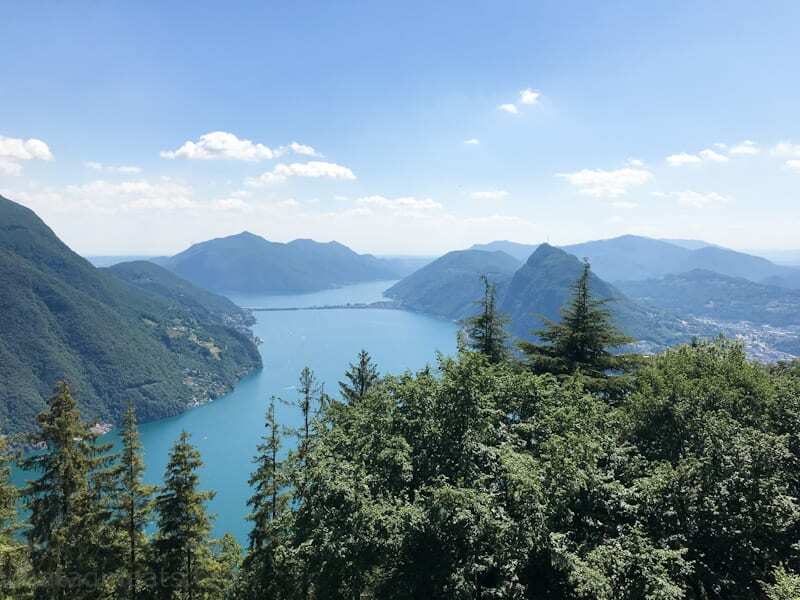 Monte Brè is situated over 3,000 feet above Lake Lugano and offers breathtaking views of the region. Funicular ride to Monte Brè. The funicular, which has been restored to the original 1912 design takes just a few minutes to reach the top. Once there, you’ll find the little town of Monte Brè, restaurants and terraces. 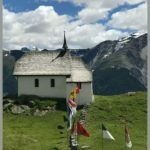 Everything in Lugano is a pretty easy walk, and Monte Brè is no exception. 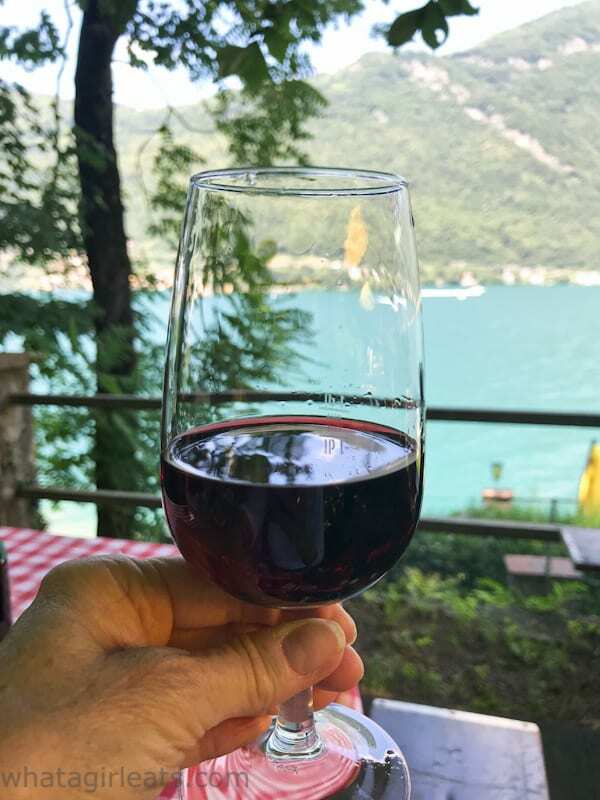 We spent an hour walking around the shaded hillside, had a drink at one of the restaurants perched on the edge of the mountain, and just enjoyed the marvelous views. 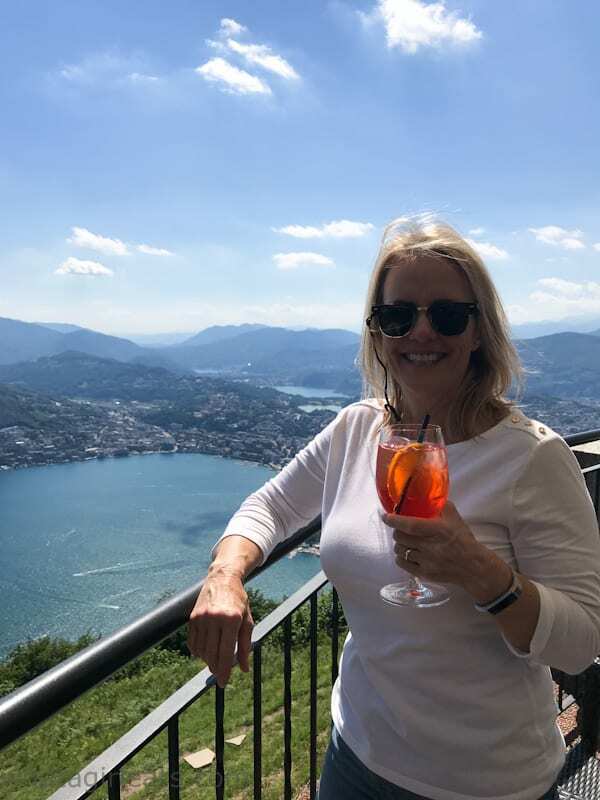 Aperol spritz and glorious views! 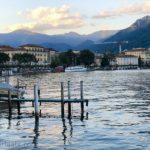 When we finally returned to Lugano, we walked back to the Hotel de la Paix. After freshening up, we walked through Lugano, which was buzzing with World Cup fever. Switzerland had just won a game the previous evening. 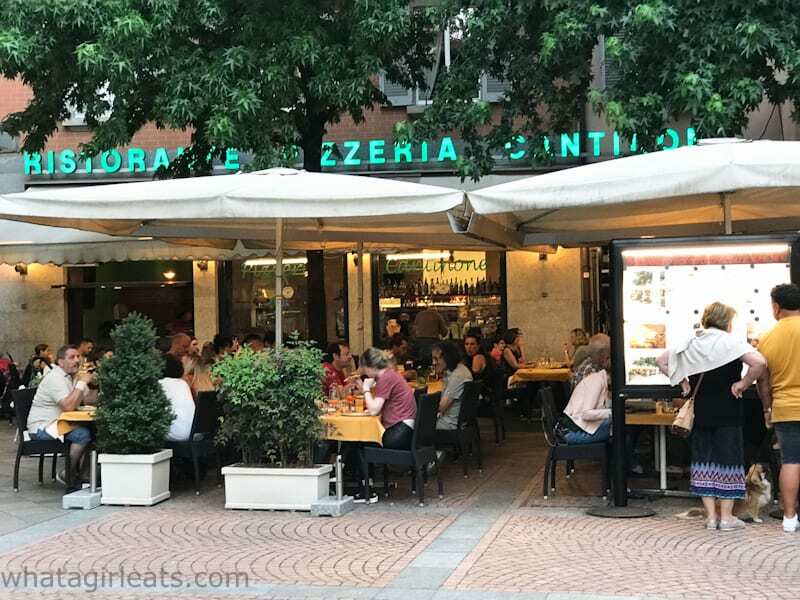 We found a cute restaurant right on the piazza, Ristorante Cantinone , that had outdoor seating, a reasonably priced menu, and delicious food! 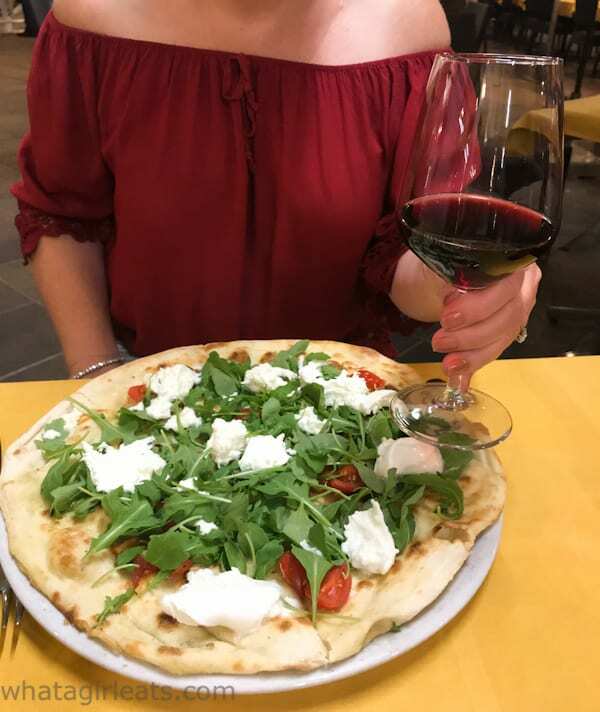 Naturally we started with an antipasto platter of locally cured meats, Christina had a delicious thin-crust pizza topped with fresh arugula and I had the Penne alla Vodka. Both got our stamp of approval! 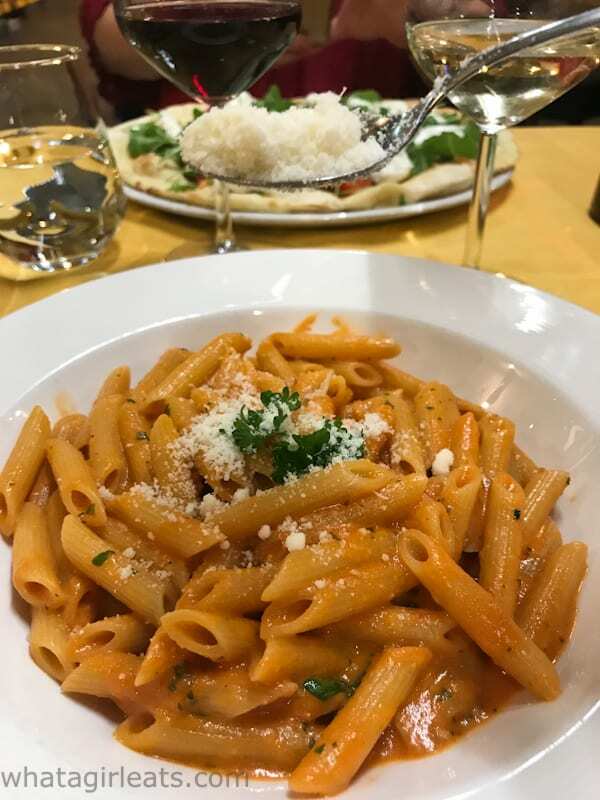 If you want to try your hand at Penne al Vodka at home, here’s a link to Christina’s recipe. 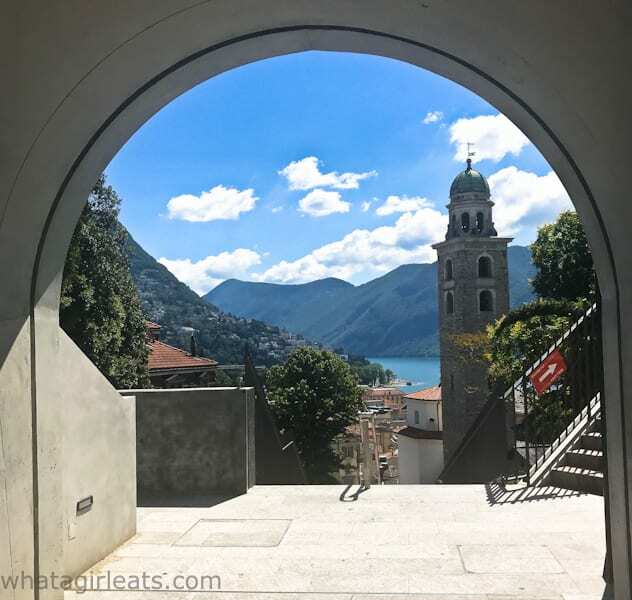 You can read Christina’s post about Lugano here! 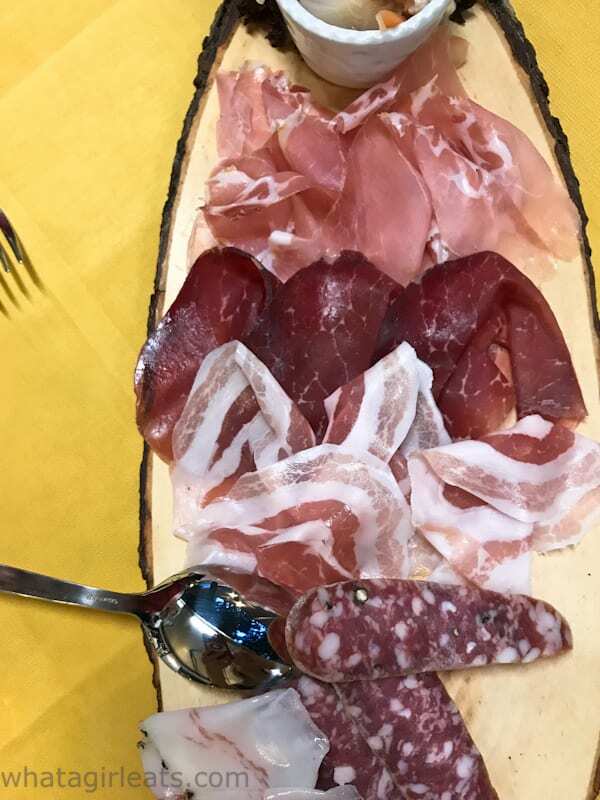 But the highlight of our stay was definitely the Cruise and Cook in Lugano! 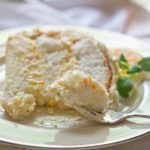 It’s a bucket list item for any traveling foodie! 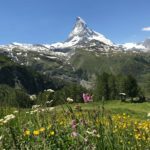 My travel and tours were hosted by Ticino Tourismo. For more information on the Cruise and Cook, or Monte Bre’ click on the highlighted links. wow, what a good time you had! 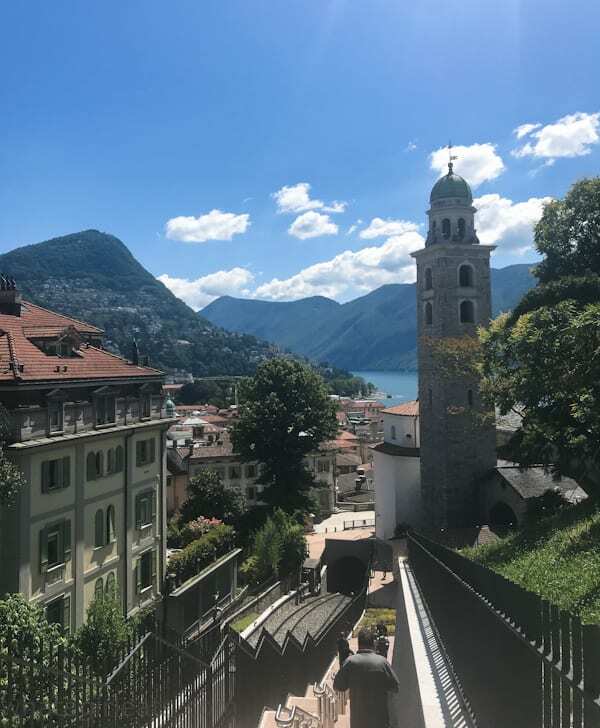 I’ve fortunately been to Lugano – it’s just so beautiful. And you had perfect weather! So you know how great it is! This sounds like an absolute must do! 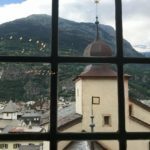 When I worked in Switzerland I went to Lugano for their annual film festival and loved it. Had really good gelato there too. You an Christina looked like you had a GREAT time! Such a good time! We want a re-do! I’ve heard the film festival is great. Such a great experience Tamara! 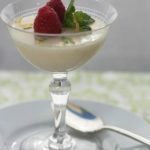 This risotto tour is not to be missed! What a gorgeous location! The food and wine sound amazing but I can’t get over those views! 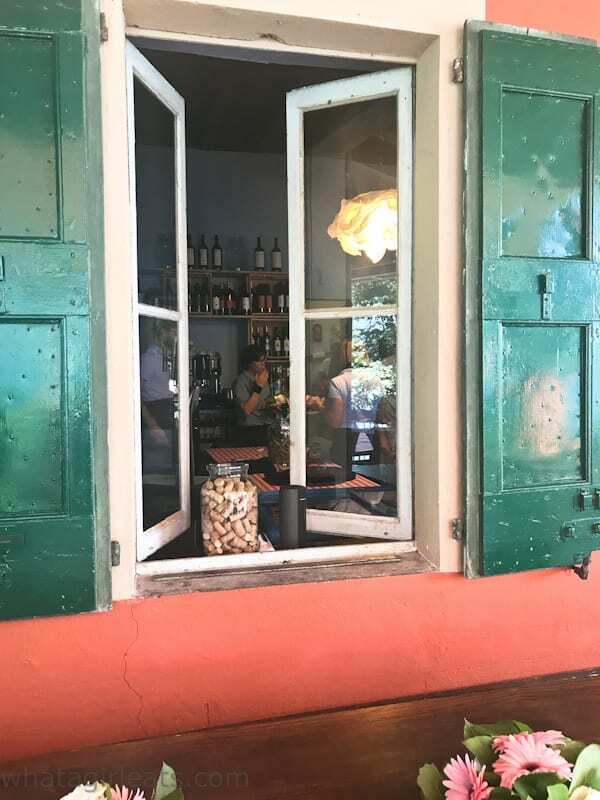 But in all seriousness, this kind of experience, one in which you get to slow down and learn about the local culture, are so valuable to travel. I’d love to do this when I finally make it to Switzerland. Such an incredible experience! It was casual, yet felt so exclusive. Great time! Hi there! 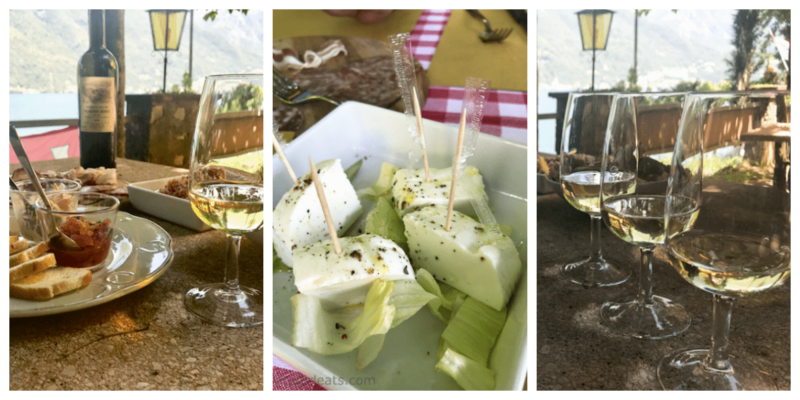 I live in Switzerland and Ticino is our fave region. I have this tour bookmarked for our next visit there with my mom—this is right up our alley. I checked out the weblink but, as you mentioned, it does not give much detail. Can you share the price you paid for this particular tour? Thanks for sharing such a great tip! I’m not sure what the cost would be for this particular trip as it was specially arranged for my friend and me. I think it would depend on how many in your group. It’s best to email Patricia for an exact price.